The Gordon and Mildred Jackson Foundation Children and Family Diagnostic Center at Pleasant Valley Hospital now offers patients a powerful new diagnostic imaging system known as PET/CT. POINT PLEASANT — The Gordon and Mildred Jackson Foundation Children and Family Diagnostic Center at Pleasant Valley Hospital now offers patients a powerful new diagnostic imaging system known as PET/CT. This hybrid technology combines the strengths of two well-established imaging modalities in one imaging session to more accurately diagnose and locate cancers while increasing patient comfort. The service started Saturday, April 6 in conjunction with Shared Medical Services of Cottage Grove, Wis.
“We are honored to equip Pleasant Valley Hospital with PET/CT imaging. This state-of-the-art technology elevates imaging at the hospital to a new level of precision and performance. Patients and physicians now have access to precise and powerful imaging that aids in the early detection and treatment of cancer,” stated Mohamed Alsharedi, MD, oncologist/hematologist from the Edwards Comprehensive Center at Pleasant Valley Hospital. 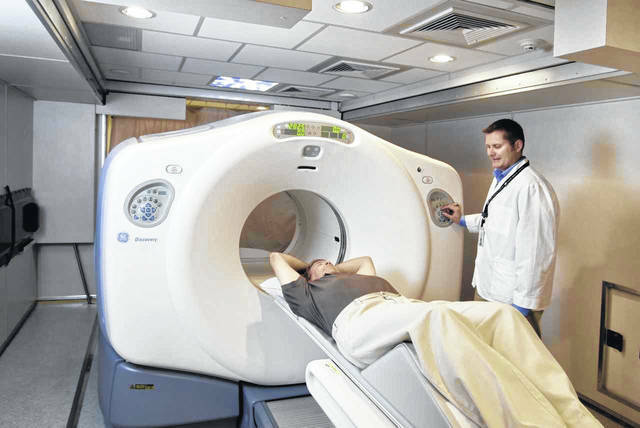 A PET/CT scan is noninvasive, painless and takes about 30 minutes. Along with providing better imaging data, it notably increases patient comfort and convenience by reducing the number of scanning sessions a patient must undergo. The procedure is covered by private insurance and Medicare. The combined PET/CT machine allows physicians to rapidly perform both scans in one session without having to move the patient. This means physicians can precisely overlay the metabolic data of the PET scan and the detailed anatomic data of the CT scan to pinpoint the location and stage of tumors. Clinical research has shown that in comparison to a PET scan alone, PET/CT technology provides new information that can alter a patient’s treatment plan to better target the cancer in approximately one-third of the cases. While PET/CT is primarily used in cancer treatment, it also has applications in cardiology and brain imaging, and it will help physicians throughout the community better understand the workings of heart disease and such neurological disorders as epilepsy, Alzheimer’s and Parkinson’s disease. Schedule appointments today by calling 1-800-500-4014.